Ben E. Keith distributes more than 11.5 million pounds of food every day. It needed a TMS upgrade to efficiently supply its customers—restaurants, hospitals, schools, nursing homes, and other institutional businesses. Ben E. Keith takes aim at freight management inefficiencies with Crossbow technology. 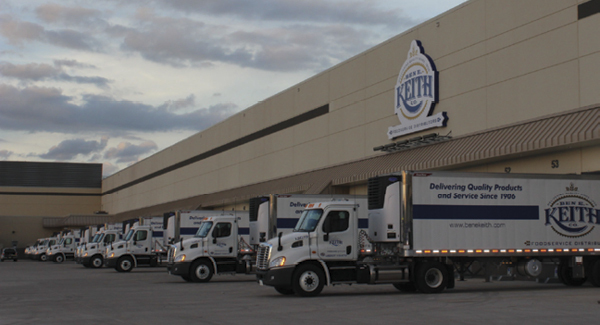 Ben E. Keith, one of the oldest and largest foodservice distributors in the United States, had an increasing need to make its 30,000 yearly inbound freight loads as full and efficient as possible. So the company took a hard look at its logistics program and zeroed in on its antiquated transportation management system (TMS). Ben E. Keith, headquartered in Fort Worth, Texas, is a heavy hitter in the crowded food distributor playing field. It offers a full line of food service products: produce, frozen foods, meats, dry groceries, paper goods, and equipment. The foodservice division serves 14 states and includes a beverage division. The company employs more than 4,000 people and purchases more than 2 billion pounds of product from close to 2,000 vendors. It services about 18,000 retailers throughout Texas. Ben E. Keith has to manage all of this product as it flows through its eight distribution centers (DCs).